A distinctive land snail found throughout much of the Caribbean is Cerion. The genus name comes from the Latin “ceri-“ meaning “wax”, in reference to the beehive shape of shells in mid-ontogeny. Many individual species occur on only one island (if taxonomic splitters are correct in species identifications). Cerion watlingense is restricted to San Salvador Island (formerly Watling’s Island) in the eastern Bahamas. It is abundant throughout the island. The shells shown in the first five photos below are modern shells, but fossil shells of Cerion watlingense also occur in the island’s Pleistocene and Holocene bedrock & paleosols (see bottom five photos). San Salvador has one other nominal species - Cerion rodrigoi, but that has a distribution restricted to parts of the island’s eastern coast. Extensive hybridization has occurred between C. watlingense and C. rodrigoi, resulting in intermediate morphologies. Some researchers suggest that recognizing two separate Cerion species on San Salvador may not be warranted. Taxonomic lumpers assign San Salvador Island’s forms to Cerion glans. Cerion watlingense is a true land snail and living specimens can be found attached to vegetation or rock surfaces. Dead & empty shells are found all over San Salvador Island - inland, near the coasts, along the shores of ponds and lakes, and on marine beaches. Empty shells are sometimes occupied by terrestrial hermit crabs. Classification: Animalia, Mollusca, Gastropoda, Pulmonata, Stylommatophora, Orthalicoidea, Cerionidae. 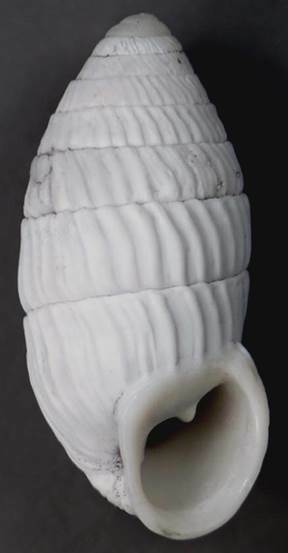 Cerion watlingense Dall, 1907 - modern shells; large white shell at center is 22 mm tall. Cerion watlingense Dall, 1907 - abapertural (left) and apertural (right) views of a 23.5 mm tall adult shell. The shells shown above & below are from the northeastern part of San Salvador Island. 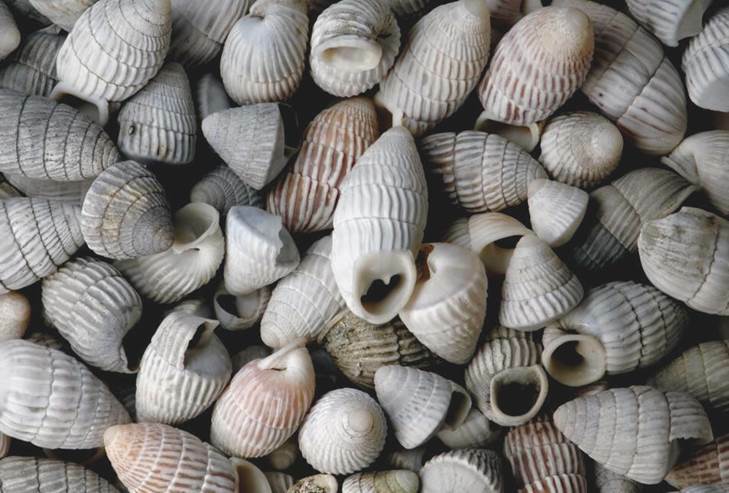 Shells found there range from whitish to grayish to mottled brownish. Most of the specimens are adult shells (see above). Adult shells in Cerion are those that have reached “phase 3” of their ontogeny (growth). Phase 3 shells have a thickened apertural lip (cf. younger shells depicted below). Once the thickened lip is constructed, the shell does not enlarge further. Thickened apertural lips are a consistent characteristic in adult land snails. 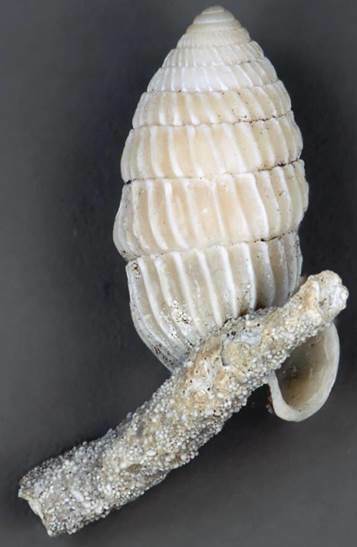 Cerion watlingense Dall, 1907 - 11 mm tall juvenile (“phase 1”) shell. The shell is subtriangular in lateral view. 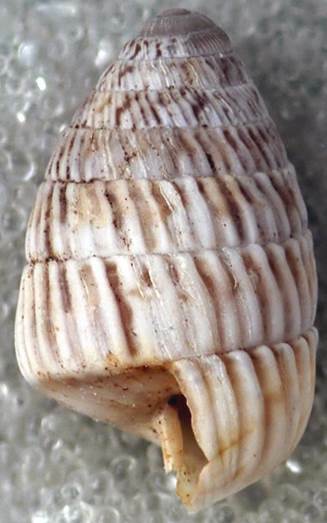 The width of the shell increases dramatically with each successive whorl. 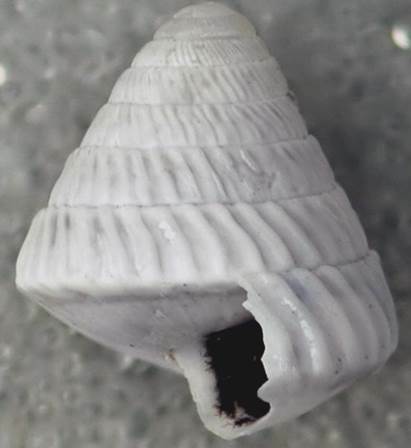 Cerion watlingense Dall, 1907 - mid-ontogeny (“phase 2”) shell (16 mm tall). After “phase 1”, Cerion enters a growth stage (“phase 2”) characterized by an increase in the shell’s height, with slight to no increase in the shell’s width. Below the juvenile portion, the shell’s margins are subparallel to slightly divergent. Note that the apertural edge is not thickened as in the adult shells shown above. 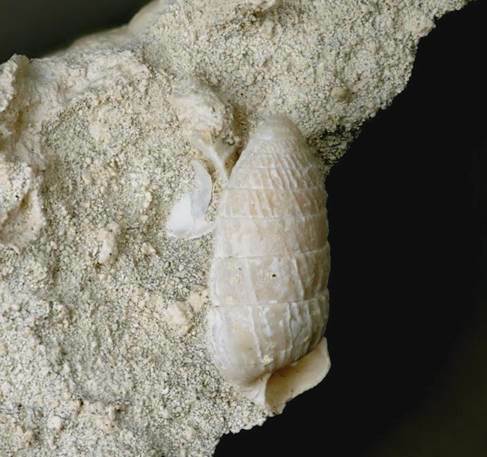 Cerion watlingense Dall, 1907 - fossil adult shell (21 mm tall) weathered & eroded from Upper Pleistocene limestone bedrock. It is diagenetically cemented to a small rhizocretion/rhizolith/vegemorph (fossil root). Calcrete paleosol (above & below; 13 cm across) - calcretes are a common type of paleosol in San Salvador Island’s bedrock. Calcretes are lithified soil horizons, and are composed of calcium carbonate (CaCO3). Calcretes are (& were) hard as rock, but they are still soil horizons. Calcretes are extreme forms of pedocal soils, and are often developed on carbonate platform islands. This Late Pleistocene calcrete is developed above an aeolian calcarenite (a wind-deposited limestone composed of sand-sized calcareous grains). 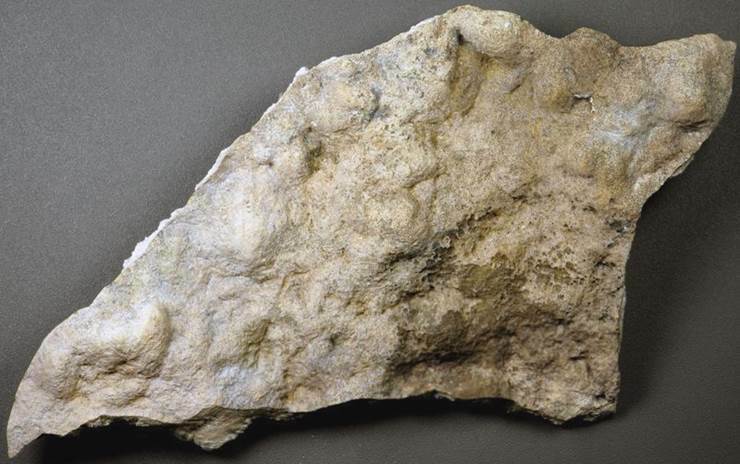 The upper surface of the calcrete sample (see above) has a somewhat smoothed nodular nature. 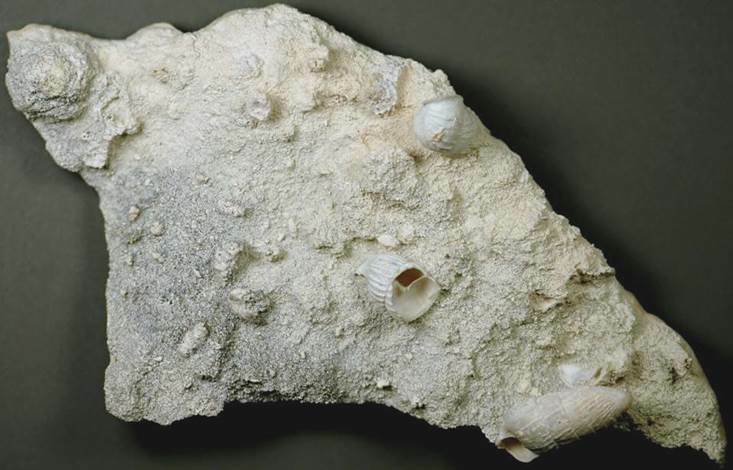 The underside of the specimen (see below) shows cemented lime sand, vegemorphs/rhizocretions, a pisolite, a fossil Tectarius snail shell, and three fossil Cerion shells. Cerion watlingense Dall, 1907 - fossil adult shell (24 mm tall) cemented to the underside of Late Pleistocene calcrete paleosol. The shell is an adult (phase 3), but the thickened aperture has been broken away. Gould (1984) - Paleobiology 10(2): 172-194. Gould (1997) - Proceedings of the 8th Symposium on the Geology of the Bahamas and Other Carbonate Regions, May 30-June 3, 1996: 73-91. Fronabarger et al. (1997) - Proceedings of the 8th Symposium on the Geology of the Bahamas and Other Carbonate Regions, May 30-June 3, 1996: 59-72. Baldini et al. (2007) - Palaios 22(2): 174-187.